The preservation of Cultural Heritage, whether it is referred to the artistic, architectural, environmental, or more generally to the maintenance of every kind of knowledge developed in the past, pursues constructive goals when it allows every individual to freely manage their cultural interests and practoice their skills to develop their knowledge in accordance with the ethical values and design paradigms that characterize their own era. For this reason, the criteria adopted for the conservation of the architectural heritage of historical interest are affected by the nature of social problems and issues related to every human ecosystem of reference. There is therefore the problem of analyzing the bases of these references in different contexts which, in different countries, are moving criteria and establishing intervention strategies which are gradually consolidating. 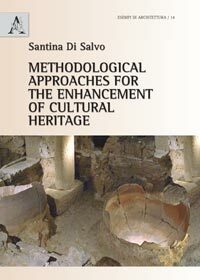 In the contribution of innovative technologies, these cultural references find a valuable contribution to value the assets properly and the volume of Santina Di Salvo has a series of very interesting examples which help us to reflect on concepts that are often considered abstract but fundamental to understand and contribute to the transmission of our past for future generations.